Over the past decade I’ve been taking a poll. During my time in China, when I would spend time with an athlete or coach, I would inevitably ask them a specific question. I’m a big believer in the Pareto Principal — focusing on the 20% or work that gets you 80% of the results. With wushu I realized that not all basic techniques are equal. Some of them have a bigger impact on your wushu than others. So this questions is a part of my search to find the highest return on your wushu training investment. It is a single technique, not a combination of techniques. In other words, “wu bu quan” (五步拳, or “Five Stance Form”) or Tan Tui (弹腿) doesn’t count because it is a combination of several basic techniques. I don’t include conditioning exercises, such as wind sprints or plyometric jumping. Just wushu techniques. Coming up with 2 or 3 techniques is pretty easy for most of the people I ask. In fact, most of the first few are pretty widely agreed upon. Its the last few that bring out some pretty good conversation when you’re recharging at a hutong eatery over a plate of lamb sticks and soy beans. Without further delay, here we go! Without a doubt, this was the universally agreed-upon choice for the top spot. Not a single person I asked didn’t say this one, and most everyone said it first. But what is it about this technique that has it providing such a positive impact on your wushu? It focuses your attention on how to generate power from the ground, legs, hips, torso and through the arms and fist. It also helps with both parts of stance work: the passive stance holding for endurance of the muscles, as well as active stance transitions for power generation and execution. Besides the standing punch, this is probably the first technique most of us learn (and often the bane of our existence as a beginner wushu student). But when someone does this one right, it is just amazing. A close second is the front stretch kick, which was the second most common answer I received to the question. Flexibility: C’mon! It has “stretch” in the name! This kick is great for helping build up leg flexibility. Posture: From the tips of your fingers to your shoulders, chest and back — this technique is a killer for helping you build good posture. Core Strength: There is a strong emphasis on having a strong mid-section, especially with the lower abs that bring up the leg. Relaxation: The more relaxed you are, the faster your kick. It teaches the importance of relaxation for developing speed. And there are related kicks to this one as well which you could work on, such as the cross stretch kick or the side stretch kick, both of which are also excellent to practice. If you want more details on the Zheng Ti Tui, then I highly recommend checking out this article on the correct ways and means of doing this vital basic technique. Essential reading for the wushu enthusiast! The smooth transition from Pu Bu to Gong Bu is one of the trickiest and hardest for beginners to perform. The requirement isn’t just on flexibility to go from a low Pu Bu (hard enough by itself) and into a stable and low Gong Bu (also challenging on its own), but having the leg strength to go along with that flexibility means you’re just adding lemon juice on your wound. The other benefit of this technique is that the coordination of the upper body with the lower body is challenging for new students. You have to not just coordinate your arms, waist and legs, but you’re also changing rotational direction from the high stance. That throws a lot of people off at first. Leg Strength: Going from High Stance to Pu Bu to Gong Bu is a real thigh burner! This can also be a challenging technique for people with poor ankle flexibility or tight hips, but it’s also a great way to help condition the body to improve those deficiencies. Oh, and this one is also great for loosening up the shoulders and building that rotational power from the waist. Where this technique really excels is the need to coordinate a good hip transition and rotation. It also helps you build up your Pu Bu endurance. One of the main challenges new wushu athletes have with this form is loosening up your shoulders. Since tight shoulders are a common issue with beginners, this technique is perfect for helping you keep things loose. Plus, this move looks pretty cool if done right. “What? Xing Bu? What’s that?” Some of you might be wondering. While not the most popular basic to practice, this stepping technique (sometimes called “Snake Walking”) will force you to work on a part of wushu that often gets ignored — flavor. This move requires you to really show good expression as well as commitment to the technique. If you do this move with less than 100% intention, it looks like you’re just walking with your hands up while drunk. But when you do it right, you can show martial spirit and awesome technique. This is also a great way to cover ground on the carpet. Since most people just sort of run across the carpet in a sequence of Dan Pai Jiao (Front Slap Kicks) or Za Quan (Hammer Fists), this can help you stand out. And even many athletes who do a version of Xing Bu, aren’t really doing it right. Running in a circular pattern is not Xing Bu. It requires you to have a heel-toe step with one foot always on the ground and the knees bent. Almost like speed walking, in a way … but cooler. This technique also helps with posture, leg strength, and core strength. Where most people have a problem is the alignment of their arms and hands with their waist, either doing the push palms too narrow, too wide, or in the wrong direction. I like to think of this like a tangent on a circle. The angles are not so acute, but you want to constantly be riding the edge of the curve of where you are stepping. Here is a video of the amazing Liu Qing Hua performing a Xing Bu in her 1997 Chang Quan form. It is at 0:49 on this video and you can definitely see the difference in how she does it vs. people who just run in a semi-circle. Good for developing explosive kicks and good slaps. Here is a walking version of the technique (hard to find the continuous version on youtube for some reason). So, now that you know this information, what does it mean? For me, it means that I can create a training routine that is short, compact, and has a big impact on my wushu no matter where I am. Many of us aren’t professional athletes with hours each day to train. If you’re traveling, short on time, have a job, kids, etc., then this means you can still work on your wushu without having to commit hours and hours to a full class. 1) Warm up (stretching, jumping jacks, sprints, burpies … break a sweat and loosen up your muscles and joints for the workout. If you do this well you can get there in around 10 minutes. 3) Rest for 2 ~ 3 minutes. Then do it again. If you’re short on time, then one sequence is great. If you have more time, then try to do 3 to 5 circuits. The whole circuit, including rest time, should take you about 10 to 20 minutes, depending on how many reps of each exercise you do. MaBu GongBu Holding: 10 sets of 5 | 10 | 20 second holds – basically hold mabu for 5 – 20 seconds, then, without getting up, transition to gong bu and hold for 5 – 20 seconds, then back to mabu and then to gong bu on the other side. one set is 4 holds (2 mabu and 2 gong bu each side). Xing Bu figure 8 to Dan Pai Jiao: 5 | 10 | 15 figure 8’s – run Xing Bu in a figure 8 pattern and at the end of each figure 8 do a 3 step running dan pai jiao. Then rest for 30 seconds and do another one. This exercise is basically like a wushu wind sprint, and great for training your endurance and leg strength. Dan Tui Chong Quan holding: Do a dan Tui Chong Quan and hold your leg out for 10 | 20 | 30 seconds, then do the other leg and hold out for the same time. Go through 10 kicks (or more if you like). Great for hip flexor strength. 5) Rest 1 minute. Then do it again. Try to do 2 circuits of conditioning if you’re a beginner and 5 if you’re advanced. It will take you around 10 to 20 minutes depending on your level of fitness and how many you do. 6) After you finish, don’t forget to stretch and cool down! So, there you have it. If your’e short on time, just do one circuit of the basics and conditioning – that should take you around 25 to 30 minutes. If you’re going for it and have more time, this could be an hour workout or longer. This isn’t meant as a replacement for your normal training, but as a supplement for those days when you don’t have time for a full class or you aren’t able to train with your teacher. Of course your coach knows best so always confer with them when thinking about supplementing your training outside of the wushu guan. So, what about you? Do you agree with these 5 techniques? What techniques would you include as well? Have any favorites that should be mentioned? Post them up in the comments below and share! I’d love to get more feedback and learn what other techniques to add to my training. Before we finish up, I wanted to share with you a great video of the Shanghai Wushu Team in St. Petersburg, Russia from 2011. (It has over 30,000 views, so odds are you’ve seen it by now.) The great thing about this video is that almost all the 5 techniques I mentioned above (with the exception of Xing Bu) are demonstrated on this short, compact video. Plus, it’s just a great video to get you pumped up to train. So, that’s it for now. As always .. train hard! Thanks for the comment! In hind sight I should have asked the same question for each of the weapons and the other styles too, like Nanquan or Taiji Quan. I did for Nanquan, but not as much for styles that are less common, like Nangun or Tongbei or something. Man .. you could write a whole book on the “top 5 basics” for all the styles. 🙂 Maybe in my next life. lol. Great stuff, Mark!!! So great to see you posting here again! Hope your training is going well! Great news!! BTW Mark, have you ever considered writing a Wushu book? Even if it were just an ebook on Kindle? There is so little Wushu knowledge (even awareness) in the west… There isn’t even much Shaolin Kung Fu knowledge out there. Ah … I don’t think I really have the knowledge base to write a book on wushu. there is way more than I don’t know still. If I wrote a book on it, it would have to be from more of the perspective of someone who is just interested in it. Or, more like “here’s my approach to wushu training” kind of thing. I wrote a book a few years ago, but it was a novel that had martial arts in it, vs. a book about martial arts. 🙂 Maybe I’ll put that on Kindle first and see what happens. But I agree. There should be more books about wushu out there. That’s not a bad start regarding the fiction novel, but what you suggest as far as someone who is interested in it would be nothing else. And it’s dated, but still beats nothing. My point is, there literally is NO competition out there. And you could look at it as honoring your teachers and masters, and giving the art more attention. I think you could dig through your blog posts, basically lay out an order to what you should learn in what order, and probably just put links to the various moves, worst case — just skipping pics and captions. Thanks for your kind words. Its food for thought, for sure. Maybe that can be one of my projects at the end of 2016 or early 2017, as I have a lot going on between now and then. Good! Put some thought into it, and I’ll search for that book. Thanks for the recommendation!! Dear coach mark. Thanks for sharing this post. Very nice thing by arranging all very important basics which covers all jibengong. And the video of Shanghai wushu team already i see very impressive one totally your msg reveals me some thing i miss before. Really thanks. Thanks Ravi! Yeah … i really like watching that video of the Shanghai Wushu Team … or actually any videos of high level athletes doing basics is inspirational for me. 🙂 I might not be able to do all the forms and jumps as the pro’s, but basics are one things I can practice and keep improving on every day. Great stuff, very important for the players. Many of them don’t much consider about the basics and try to practice only the routine and expect to reach better performance level. Other issue I noted is even they practice these basics they don’t try to do it perfectly. But these basics are essential and steer them to better performance as you clearly highlighted. This is an important article which presented very nicely. Thanks and appreciate your effort very much. Awesome!! I’ve been waiting to hear about these 5 important techniques 🙂 Thanks for including videos too! 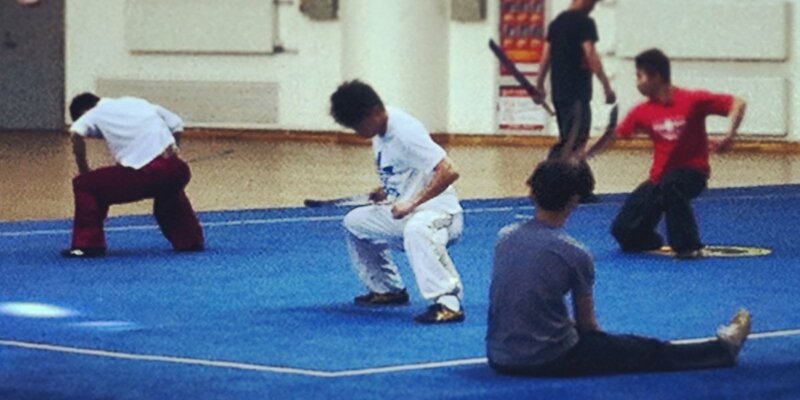 My name is Peter and I am Wushu coach in San Sebastián (Basque Country, Spain). I liked it because I think like you that the key is the basic Wushu Training. I am also president of the Club: “Wudeporclub”. The aim of the Club is to promote the practice of Chinese Martial Arts. I send you this message to ask: Could I post your article on my blog, in Spanish ? : http://www.wudeporclub.blogspot.com? I agree with all of these!! I love reading your posts about wushu, they’re so informative and well written. Another stance that I think has helped me the most is shu bu (empty stance). It’s a killer on the legs and helps with one-legged squats!